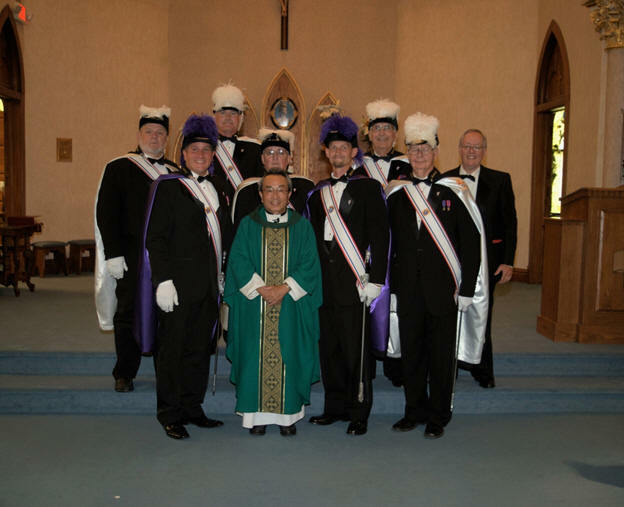 Members of the Knights of Columbus Bishop Roger A. Kaffer Fourth Degree Assembly and the Dr. Thomas A. Dooley Fourth Degree Assembly provided an Honor Guard for Fr. Tuan Van Nguyen Pastor of St. Mary’s Catholic Church in Minooka on the 30th anniversary of his Ordination July 10, 2016. Pictured with Fr. Tuan are members of the combined Assembly Honor Guard Front row Fr. Tuan Van Nguyen, 2nd row Commander Eddie Collins Past Faithful Navigator (PFN) of Bishop Roger A. Kaffer Assembly, Mike Herbst Past Faithful Navigator of the Bishop Roger A. Kaffer Assembly, Commander Dan Wascher of the Bishop Roger A. Kaffer Assembly, Robert E. Skidmore PFN of the Bishop Roger A. Kaffer Assembly, 3rd row Roger R. Dooley PFN of the Dr. Thomas A. Dooley Assembly, Bob Martin Faithful Navigator (FN) of the Bishop Roger A. Kaffer Assembly, Leon Ivanauski PFN of the Dr. Thomas A. Dooley Assembly, Sir Knight John Miller of the Dr. Thomas A. Dooley Assembly. Fr. Tuan is a Fourth Degree Member of Dr. Thomas A. Dooley Assembly. The Photo was taken by Kathy Sabuco.